This second edition reflects the latest requirement of the National Curriculum, GCSE specifications, ideas from recent curriculum development projects and the current availability of IT. 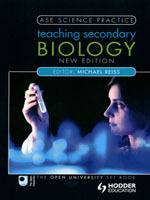 This book draws on the experience of a wide range of teachers and those involved in science education. It has been produced as part of the Association for Science Education's commitment to supporting science teacher by disseminating best practice and new ideas to enhance teaching.